FutureWorld aims to convey the continuous interaction between science fiction, science research and science fact. It focuses on the feed-forward and feedback between plausibility and reality. It takes upon itself the ambitious task of bringing pure science closer to the general public – an admirable feat towards broader education, understanding the world around us and stimulating curiosity for further discoveries. Professor Mark Brake and Reverend Neil Hook achieve a significant impact on the reader in all three of these significant areas. The book relates science fiction to pure science by the inclusion of one hundred multidisciplinary and cross-referenced examples from popular press, movies, books and scientific developments in a little more than a hundred pages. It further categorises these entries into four conceptual themes: space, time, machine and monster, in its aim to reveal a relationship between “the human, and the non-human aspects of the Universe”. However, the reader is at times perplexed at the development of the theme as the majority of the one hundred entries appear to lack chronology, scientific or even alphabetical pattern. This is further emphasised by the arbitrary division of each theme into twenty-five entries that does not reflect the significance or relative extent of treatment of those themes in scientific fiction or research. Inevitably, at times it deviates from its primary purpose towards less relevant examples, such as quoting Miss Alberta at the expense of overlooking science fiction writers such as Joe Haldeman or Michael Straczynski. However, it does achieve an impressive impact on those less acquainted with the great expanse of science fiction and research around the world. 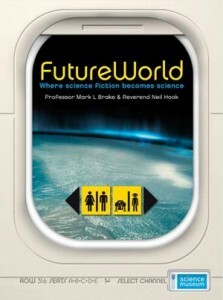 FutureWorld can provide a concise and intriguing first step towards an introduction of the links between science fiction and research.